Be the first to share your favorite memory, photo or story of Kazumasa. This memorial page is dedicated for family, friends and future generations to celebrate the life of their loved one. 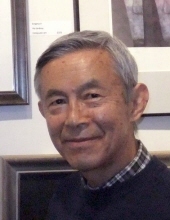 Kazumasa "Kaz" Oda died on Friday, November 30, of heart failure at his home in Bridgeport. He was 76. Born in Shizuoka, Japan, in 1942, after graduating from Aoyama University in Tokyo, Kaz came to the United States, where he studied Interior Design at Parson’s School of Design in New York. He had a long and successful career in that field, working on major commercial interior design projects for prestigious design firms. He moved with his wife Stephanie to Connecticut in 1976 where their son was born. He founded his own design company, which he headed until the time of his death. Kaz was a true renaissance man. A prodigiously talented artist, he won numerous awards for his oil and watercolors and exhibited frequently in New York and Tokyo as well as locally. He was a member of the Black Rock Arts Guild and Black Rock Congregational Church. Active all his life, Kaz held a black belt in Judo and ran a total of 41 marathons, including Boston and New York. Dancing became his passion in recent years, at which he excelled. Kaz was, above all, an adoring father of Jason. Everywhere he went he made friends and was deeply loved, both locally and abroad—especially Japan and Ireland—two countries he visited often in his lifetime. He was outgoing and optimistic, although he knew he was seriously ill. While physically his heart was not strong, his spiritual heart was big, generous, warm, loving, all-embracing and forgiving. He is survived by his beloved son Jason, his brother Yu-san, his ex-wife and friend Stephanie, a niece and a nephew. A memorial service will be held on Saturday, December 15, at 11:00 a.m. at Black Rock Congregational Church, 3685 Black Rock Turnpike, Fairfield, CT followed by a reception at the church hall. In lieu of flowers, contributions in his memory may be made to Black Rock Congregational Church. Please visit www.pisteyfuneralhome.com to express condolences online. To send flowers or a remembrance gift to the family of Kazumasa "Kaz" Oda, please visit our Tribute Store. "Email Address" would like to share the life celebration of Kazumasa "Kaz" Oda. Click on the "link" to go to share a favorite memory or leave a condolence message for the family.